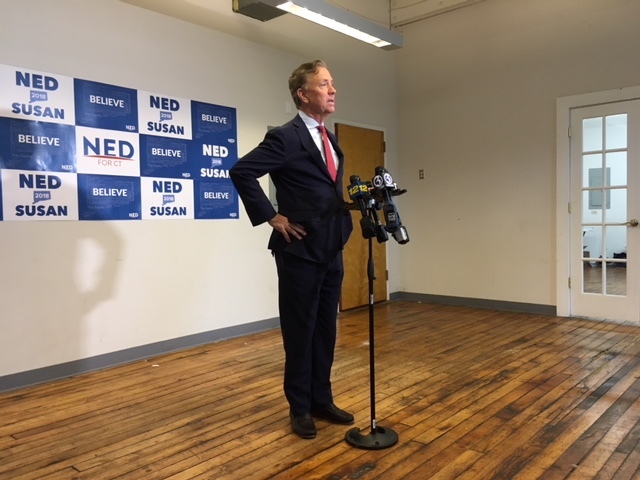 Ned Lamont outlining his DMV plan at his campaign headquarters in New Haven. 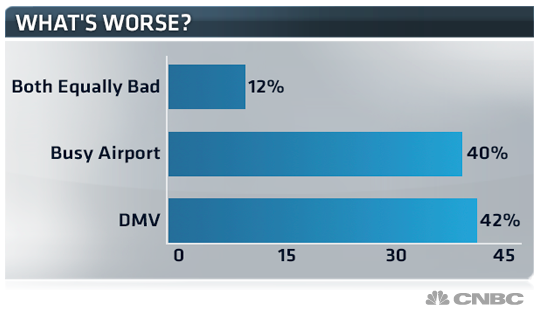 You probably think of the DMV as just a place to get your license or registration — usually after an interminable wait. Comics have long used it as a punchline. Ned Lamont on Monday became the latest politician to use it as a metaphor for what is wrong with government bureaucracy. Lamont is proposing to extend license renewals from six to eight years and car registrations to three years, making them concurrent with the length of many car leases. He also hopes to update the DMV’s computers and improve customer service. Bob Stefanowski, the Republican nominee, has proposed privatizing the state agency, an idea that was central to the campaign of one of his competitors for the GOP nomination, Timothy Herbst. Tinkering with the DMV may be political small ball, but it is more relatable than dealing with deeper, near-existential issues like how to restart a stagnant economy, stabilize tax collections, and address massive unfunded pension liabilities. Herbst said one of his regular stops campaigning for the GOP nomination was to drop by DMV offices before they opened and talk to customers waiting in line. “I would have a captive audience,” Herbst said. Gov. Dannel P. Malloy forced the resignation of a DMV commissioner in January 2016 over the failed implementation of a new computer system. 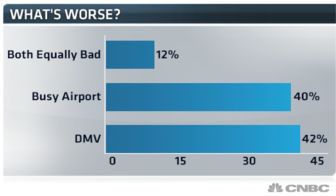 CNBC surveyed viewers in 2014 on which was worst — air travel or going to the DMV. Lamont said the Connecticut DMV is emblematic of a state government that is archaic. “The DMV needs a change in leadership and priorities that will increase efficiency, reduce wait times and provide better quality service to the state, and that’s only going to happen with Bob Stefanowski as governor,” Marr said. The next governor will take office in January unable to make immediate steps towards privatizing services, given a two-year ban on layoffs. Lamont, who is endorsed by the Connecticut AFL-CIO, said he is not necessarily opposed to privatization. In March 2016, Malloy named a new team, including a retired corporate executive with experience fixing customer service systems, to oversee the outsized headache that the Department of Motor Vehicles had become. Judeen Wrinn, a former executive of Aetna, ING and Voya, was named deputy commissioner with one focus: to diagnose and repair a customer-service disaster that DMV officials blame on a new computer system that went live in August 2015. “The DMV should not be a form of punishment,” Malloy said in 2016. Commissioner Michael Bzdyra could not be reached Monday for an update of the customer-service initiative launched two years ago, but a spokesman pointed to data showing the overall average wait time dropped from 76 minutes in November 2015 to 41 minutes in December 2017.